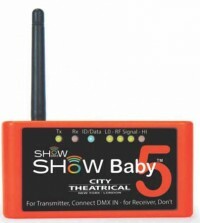 City Theatrical is launching a new version of the SHoW DMX SHoW Baby wireless DMX system called SHoW DMX SHoW Baby 5. 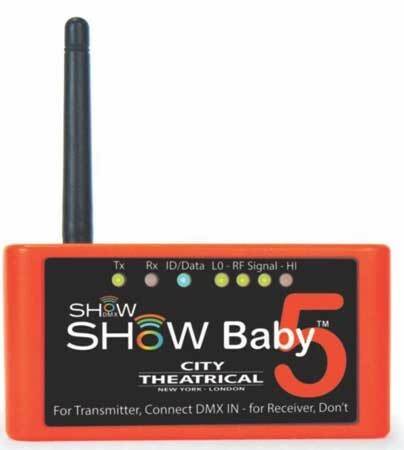 SHoW Baby 5 now has five SHoW IDs, allowing systems to be scaled up to multi universe broadcasts by using more than one transmitter, or as a way of avoiding interference from other SHoW Babys in the area. SHoW Baby 5 is still plug and play. Each unit is a transceiver and by plugging a DMX cable IN, it automatically selects itself to be a Transmitter. If nothing is plugged into the DMX IN port, it selects itself to be a Receiver. SHoW Baby 5 is the same price as the original SHoW Baby and is compatible with all existing SHoW Babys in the world. There are still seven indicator lights on the front of the SHoW Baby, four for signal strength, one to designate whether it is a Transmitter, one to designate whether it is a Receiver, and a data present light. In the SHoW Baby 5, the data light (now labeled ID/Data) serves a second purpose, and this is to designate the SHoW ID. A small indented button on the back of the unit, when pushed, cycles through the five SHoW IDs, and the user selects the same ID/Data lightcolor for the Transmitter and all intended Receivers. If there are two SHoW Baby systems in an area, or if a user needs to scale up a multi universe system by adding additional Transmitters, he needs only to select a different color of ID/Data light. All SHoW Babys are still compatible with the full SHoW DMX Neo system and can be used as receivers on that system. The SHoW Baby 5 is available with either five pin or three pin XLR connectors.